Each year, Sloan-C releases a report about the state of online learning in US higher ed. Last year's report revealed that enrollments from '07-08 increased 17% and there were many that predicted a plateau for the upcoming year. The data in this year's report, Class Differences, foiled that prediction! 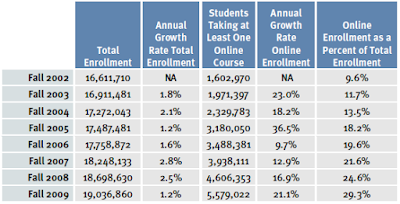 US higher ed online enrollments from fall '08-09 increased 21% from the previous year and comprise roughly 30% of all higher ed enrollments. While the rate of increase year over year continues to reshape enrollments it's important to keep this growth in perspective with what's happening with overall higher ed enrollments -- they remained relatively stagnant at 1.2%, even less than the previous year's total growth which was 2.5%. This means, each year more and more college students continue to take more online classes and less face-to-face classes. In 2009, one in three college students was enrolled in at least one online class. Institutional Planning for the Blended College Experience - what's happening on your campus? The continued unbundling of our traditional vision of college as a brick and mortar, face-to-face experience to a blended or fully online learning journey will continue to challenge traditional approaches to institutional planning. If you work at a college or university, I'm curious to know if you hear your college leaders speak/write about online learning in their strategic presentations about the future of your institution. If they speak or write about a need to plan for "growth," are they envisioning much of this growth to be online and encouraging a bolstering of technological infrastructure in line with increased faculty support for online pedagogy, technological support/training, and accessibility/media specialists; as well as online student services -- rather than "more buildings?" How is this shift challenging traditional approaches to staffing (for example, does your college hire non-local online instructors? Do you assess them in some way to ensure they're skilled in online teaching prior to hiring them? Finally, Is online learning included in your institution's mission statement in someway? If so, how?